Jacob was a liar and a cheat. He thought of ways to take what didn’t belong to him — Esau’s birthright and blessing. Esau was a careless — he sold his birthright for some soup and bread. Esau was murderous — he wanted to kill Jacob. But through it all, God was with the brothers. He never left them. He knew their weaknesses, and he still worked through them to accomplish his good and wonderful plans through them, even when they messed things up. The story doesn’t end there. Twenty years later, when Jacob wanted to bring his large family back to his homeland, he was very worried that Esau would still be angry with him. He brought all sorts of gifts to try to appease Esau. He went to meet his brother (who was accompanied with 400 men) and bowed down to the ground 7 times. 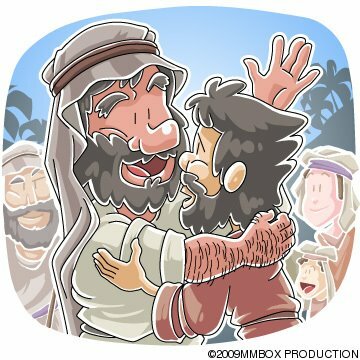 But surprisingly, Esau ran to meet his brother, hugged him tightly and kissed him. And they both wept. Esau met and welcomed all of Jacob’s family. Despite all the wrong Jacob had done to him, Esau had forgiven him. Esau showed him grace. Just like the father who ran to welcome the prodigal son who spent all his money and returned dirty and smelly. This is a picture of God’s unmerited grace through Jesus. Just as Jacob schemed, lied, deceived, cheated, and caused great heartache and pain to Esau, we have done likewise to our heavenly Father. Just as Jacob struggled and tried by his own efforts to earn Esau’s forgiveness and found it all unnecessary, we do the same by trying to be good to earn God’s favor. And finally, just as Esau extended grace and forgiveness to Jacob despite all the injustices and suffering, God’s amazing grace is extended to us when we accept His gift of forgiveness in Jesus Christ! Pls click this the article : ENJOY ! ! !